Riveted is definitely Meljean Brook's best to date and I'm only upset I now have to wait to read more by her. Needless to say, it'll be tough to follow this one up, but if anyone can pull it off, it'll be her. Riveted takes a pleasant detour from the world we've come to know from Meljean Brook and introduces to a completely different aspect of this realm: the icy north, home to legends of magic and mystery. In reality, however, the tribes of Iceland are made up women who are forced to keep themselves hidden from the rest of the world. When David, a geologist, goes searching for his mother's people in the north, the only link he is able to find is Annika, a woman serving on an airship. Surprisingly enough, for him, Annika proves to be more than a mere source of information...she may even become an unexpected friend, ally, and lover. What makes Riveted so very different from other novels is the fact that it centers around a secret society where women and their partners can live together away from the prying - and judgmental - eyes of the rest of the world. Annika, the adopted daughter of her mother, accidentally lights a fire in her tribe and for her mistake, her sister takes the fall and leaves. Now, Annika has sworn to protect both her family and find her sister before returning home, but David Kentewess proves to be a true test of her faith. David yearns to seek Annika's people to put his mother's memory to rest, but Annika can never tell him the truth, both because she values his opinion and is sworn to secrecy. As such, it is a difficult and unique situation that is struck up between these two - one that makes for a scintillating and steamy read. Annika, from the beginning itself, is vivacious and independent. Not only does she not care what others think of her, but her own opinion of herself is so vastly different from the truth. Where Annika sees herself as the Annika "Rabbit" of her childhood days, life has forced her to mold into a strong and courageous young woman whose bravery and intelligence is unrivaled. David similarly suffers from issues of self-confidence, shying away from his own reflection because of his mechanical limbs. As Annika and David begin to know one another, though, they also begin to see beyond the outer layers of falsehood into the true soul that lies beneath. Without a doubt, this is my favorite Brook love story to date, merely because of how slow, sure, and awkward the interactions between this couple were. Annika and David needed to not only understand one another, but also trust each other in a world that had made them estranged from all others. In each other, though, they saw the reflections of their true selves - the best gift of all. As with all of Brook's books, Riveted is primarily character-driven, but it has its share of intriguing villains and machinery (trolls!). Although the action isn't as high as with the previous two novels in this series, the overall book itself benefits. Furthermore, Riveted isn't in need of an epilogue novella to tie its loose ends and secure our feelings towards this couple - the book itself is sufficient. Annika and David are perfect for one another, both balanced and loyal from beginning to end, unlike the tumultuous relationships between previous Brook pairings. Quite honestly, their story ends on the perfect note and leaves you with nothing more than a gaping smile, full heart, and contented sigh. If that isn't the best you can ask for from a book then I don't know what is. Trolls? I don't know why that's the part that intrigues me the most. ;) I'm glad you enjoyed this, Keertana! I love the sound of Annika and David's relationship, and I like that this is generally quite character-driven. I need to get started on this series! :) Great review. Ahh, this is the only one I have yet to read, but I know I'll love it. 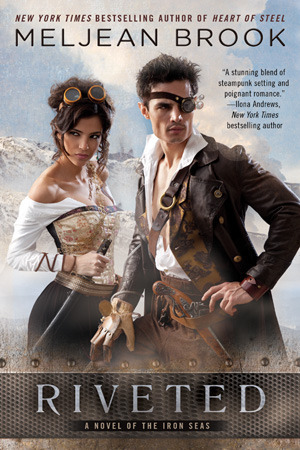 Meljean is brilliant and she is queen of alternate history steampunk. Also, trolls? Well, sign me up. I've been saving this one for a time of great need, but considering the depth of my reading slump lately, I'd say the time has come. I love that it's all resolved and that it doesn't need an additional novella - as much as I liked them, I love my satisfying endings more. This sounds like such a wonderful read Keertana! I love it when characters so great growth and the relationship between Annika and David sounds wonderful! Thank you for putting another great series on my radar! Gorgeous review! "Without a doubt, this is my favorite Brook love story to date, merely because of how slow, sure, and awkward the interactions between this couple were." MUST READ THIS KEERTANA! I'm so excited to meet Annika and David, they sound like an extraordinary couple and if they're your favorite of Brooks then I can't miss out on them. I'm a sucker for awkward romantic interactions, they just make me happy because they always feel genuine and real. Gorgeous review! There are trolls?! I'm in love what that little tidbit alone! This does sound like a good read though, and I really enjoy the occasional character-driven novel when it's done well, which it sounds like this is. Keertana, thanks so much for sharing this title with us! I'll have to admit that this cover is pretty silly IMO, BUT I want to go exploring Iceland now. This book sounds like a lot of FUN with a strong protagonist and a balanced romance. Look at you go on the series challenge too!